As the manufacturer of Mercedes-Benz and Setra buses, we offer you the greatest expertise when it comes to the availability, safety and reliability of parts. 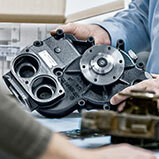 Benefit from reconditioned replacement parts with proven OMNIplus quality. Pre-order all parts for your vehicle online, check the availability and pick them up at a BusWorldHome service point close to you. Whether belt, fan or discs - we have all spare parts documented. 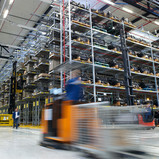 Learn about the central European warehouse with over 130,000 replacement parts.